This week I am thankful for friends who drop everything they are doing and come to take me to the ER, sit with me for a few hours, take my 5 kiddos to their house for more hours, let us chill their for more hours, and then buy us dinner. I was feeling like complete poo this day and it was nice to have friends that we can lean on when we needed it. Thank you all so much for everything! I definitely have my moments when I feel overwhelmed because more than one kiddo is crying and I can’t just pause life to fix each problem one at a time. I haven’t mastered walking & breastfeeding so there are some things that get pushed back until I am finished feeding Lily. I know it’s going to take some time to get into the groove of having 5 kiddos and everything that goes along with it. I am just thankful that it’s summer time & I don’t have to worry about getting any kiddos from school or things like that. Evenings are more crazier than they were before but that’s to be expected with 5. And we are officially full to the max in our truck….we cannot fit anymore bodies in that thing! The good thing is that we still have room for groceries and anything that we need to bring with us. Thank goodness our trunk area is a good size! I wanted to wait until I got Lily’s birth story up before I started posting postpartum updates. These updates will be about both Lily & I.
Lily is doing so good! When she was born she was 7lbs 11oz when we went to her 1 week check up, she was 7lbs 5oz. Her dr doesn’t think that she will have any problem being past her birth weight when we go back on Monday. Breastfeeding started out great (like it always does) and then I hit that rough patch that I always do. I don’t know why I start out good and then something happens & it all just goes down hill from there. I have tried breastfeeding all my kiddos & it has never worked out. So because of that I was determined to make it work with Lily. When she was a few days old & I was having a rough moment trying to breastfeed her, I literally cried out to God telling Him that I just wanted to feed my child without running into all these problems & for Him to please help me! I am sitting here telling you that I haven’t had any problems since that night! I cannot express to you how happy & excited I am about that! She is 2 weeks old today & we are both going strong in that area! Breastfeeding in public is something that I am still getting used to but it’s definitely working out! Lily is a champ at pooping! 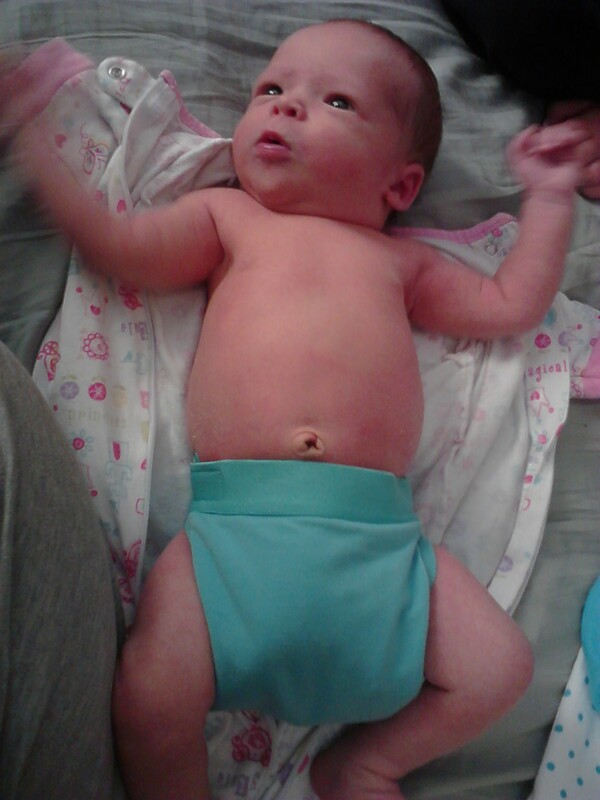 She has had one blow out diaper but, apparently, that is a good sign! I started out using disposable (just using up what the hospital gave us) before I started using cloth. Now keep in mind that I have never used cloth diapers on a newborn. I wasn’t aware of how much more you have to change the diapers…which in turn means that I am doing diaper laundry pretty much everyday! No biggie though….I would much rather wash diaper than buy them. She looks so cute in them too!!! Keep in mind this was my first csection. The first week I was sore and I had this muscle that would start to burn when I was standing too long and I would cry and need help walking & sitting. The help that was supposed to be there during the day, ended up not working out. So that means that I was home alone with all 5 kiddos 2 days after I came home from the hospital. I did better than I thought, but I was in pain & exhausted by the end of every day. Towards the end of the first week, I was doing much better. This second week is going much smoother. That muscle pain is gone & I am not as sore. I am able to do a lot more too: bending over, sitting without pain, walking without pain. I am so thankful that my body is healing much faster than I thought it would. I literally thought that I would be out of commission for a few weeks. I am not one to just sit around after having a baby and/or recovering from surgery. I have always been that way & I think that my body heals faster/better that way. This is just me and how my body is. Hopefully all will be cleared when I go back in July for a follow-up. Emotionally, I am doing better than I think I have after any birth. I have my moments when I am going crazy but nothing that I can’t handle! The other kiddos are a great help when I need it and are willing to help out too! I am very thankful for that! I am posting these pictures because once I am cleared I want to start working out (something that I was getting ready to do until I found out I was pregnant). Plus I am in shock that my body looks like it does! 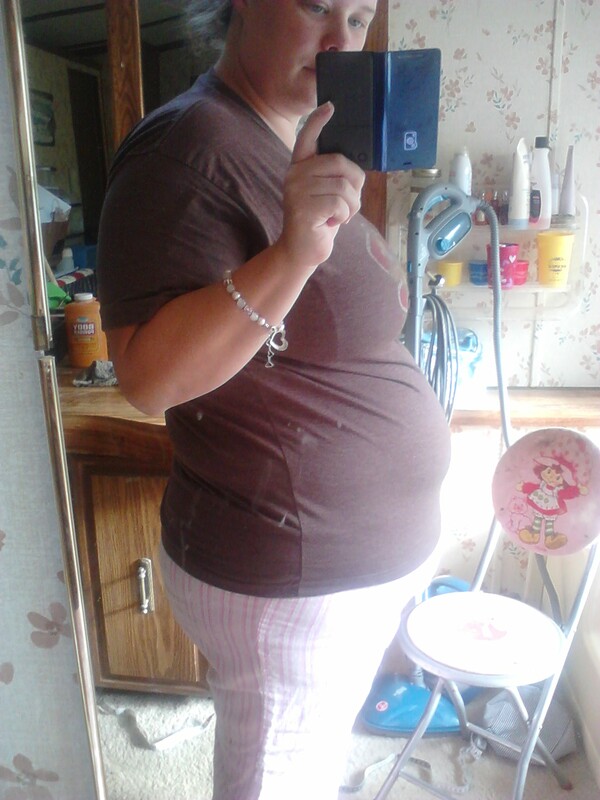 I am able to fit into pants that I couldn’t fit into before I was pregnant. So, needless to say I am pretty excited about that! So here are weeks 1 & 2 PP! Will make Week 3 update next Thursday!